The display is clearly the first thing you notice, and if not for the famed notch, it would merely be as impressive as a Samsung Galaxy S8 or Note 8. The colors aren’t as vibrant as what you’ll find on a Samsung phone—Samsung phones tend to oversaturate the colors—but as someone who prefers accuracy over eye-bleeding pop, I really like how naturally the iPhone renders colors. The first cool iPhone in years. But let me just say: I love the distinctive notch. Some consider it an eyesore, but for me, that notch screams the phone’s ostentation in a deeply satisfying way. It gives the whole 5.8-inch display a sense of space that simply isn’t found on competing phones. In fact, its display is actually larger than the 5.5-inch screen on the physically larger iPhone 8 Plus. 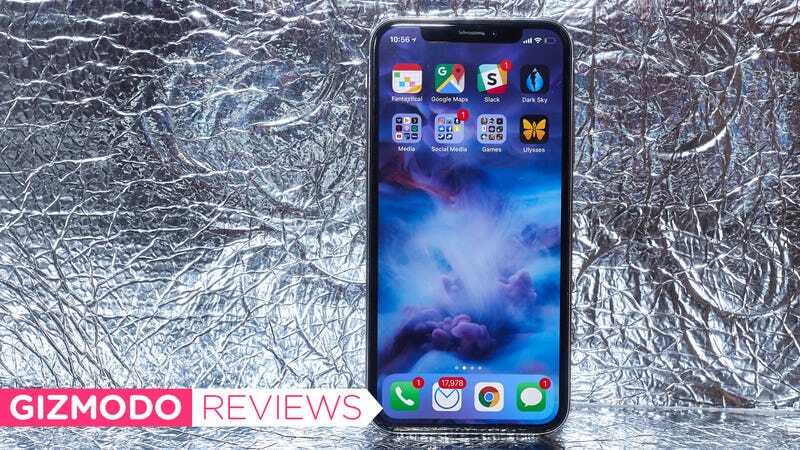 Where the screen curves around the front camera module, it feels a little like Apple has somehow cheated and rewarded the phone with more visual real estate than it deserves—at least while you’re on the home screen or in apps specifically updated to work with the iPhone X’s unique display. In other apps, the iPhone X feels a little small, with the a black band at the top and bottom of the display confining what was once expansive feeling. That screen feels like it goes on forever. Even going back to an S8 feels cramped. The big display doesn’t dramatically affect battery life too much. I never found myself wanting more power throughout the day, and I even went into day two with regular use. In our battery rundown test, in which we stream a YouTube video over wi-fi until the phone dies, the iPhone X managed a little less than 10 hours, which is perfectly average battery life when compared to all the phones Gizmodo’s tested this year, and thanks to its ability to charge quickly and wirelessly, it’s never an issue to rejuice it. My one knock on the notch is how the black doesn’t match the OLED black. What surprised me most about the phone is how I don’t miss Touch ID or the home button. Since the first rumors cropped up that Touch ID might not make it to Apple’s 10th anniversary iPhone, I’ve obsessed over the shift from the fingerprint tech. How could they possibly do it! It became a reality, and like many people, I was aghast that the technology would be forever replaced by Face ID. Instead of pressing your finger to a home button, you now glance at the phone and quickly swipe up with your thumb. Over the last few days, I’ve spent hours fiddling with the front-facing “TrueDepth” setup that makes the Face ID magic possible. It’s by far the most technologically innovative aspect of the phone. It uses a combination of a camera, IR lasers, and IR scanner to create a 3D map of your face. The camera allows you to create animoji, and gives apps like Snapchat access to your facial map so they can toss realistic-looking masks on your face. But the killer feature is obviously Face ID. I look at the phone, and it opens instantly. From there it works like an even fancier version of Touch ID. When I went to sign into Twitter, it recognized my face and logged me in. When I ordered a midnight burger off Seamless, and used Apple Pay, it scanned my face before asking me to press the power button to confirm the purchase. While at first there were some hiccups, the TrueDepth camera has learned my face since I picked the phone up from Apple on Monday. And now it doesn’t hesitate when I try to use it in the dark, or while wearing sludgey makeup, or huddled on a bench at the dog park in the morning with my hoody pulled down low. This camera gets me, and I don’t even have to hold it up directly in front of my face. As long as the camera is pointed in my face’s direction, and I’m looking at it, the phone will open. Apple changed the orientation of the two cameras, which means less of a shift when you switch from one to the other. Its a minor change, but nice! The rear cameras on the iPhone X can’t do anything that cool. They’re still very nice, but if you’re trying to decide between the iPhone 8 or 8 Plus or the iPhone X, it won’t be the rear cameras that sway you. The reason you buy the iPhone X is because of that too luxurious design, and that audaciously hedonistic display, and that super cool depth-sensing selfie camera. This phone isn’t remaking the way we think about phones in as grand a manner as the original iPhone, or even the iPhone 4. While Face ID could be the future of biometric tech on phones, that future won’t shift your world view as dramatically as the move from passcodes to biometrics in the first place. 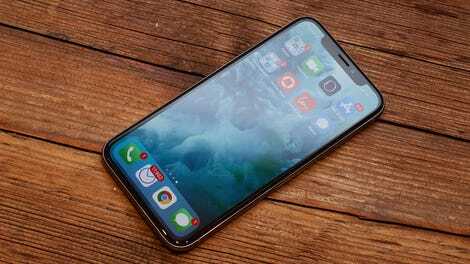 The iPhone X isn’t a leap into a new world of phone design, it’s just a showcase for what a really expensive luxury phone should look and feel like. I don’t need the $1,000 iPhone X, but after spending the last few days with it, boy do I want to go buy one. It’s $1,000 and that is way too much money for a phone. But it is a very nice phone for $1,000, and it definitely feels luxurious in a way that even its competitors do not. Face ID and the TrueDepth camera module are probably the future of biometrics and that’s very neat and convenient. The display is a stunner. No, I don’t care about the death of the headphone jack.